Every Sunday during the summer, Montreal's electronic music fans congregate for Piknic Électronik, where Alexander Calder's daunting metal sculpture L'Homme looms over a concrete plaza in Parc Jean-Drapeau. A decade ago, Nicolas Cournoyer started Piknic Électronik together with three friends. Their goal was to make electronic music accessible beyond the seedy settings of raves and after-hours bars. Today the event continues to support local talent, bringing in top international acts and showcase all forms of electronica in a comfortable outdoor space. Since this season marks the festival's 10th anniversary, there was a special concert on Saturday before the usual Sunday proceedings. 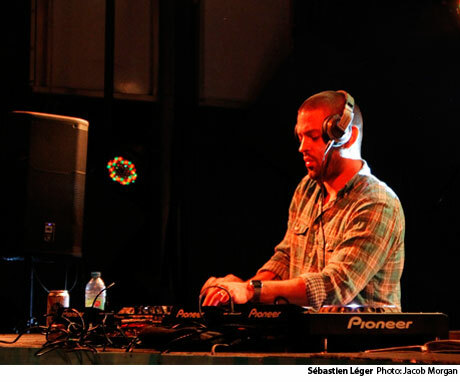 At the head of Saturday's lineup was superstar French DJ Sébastien Léger. With poppy EDM and in-your-face American dubstep becoming ubiquitous, Léger's pure breed of progressive house felt downright refreshing. His mix escalated with layers into peaks and would suddenly descend into a cascade of kick drums and snares. The effect was much like Calder's statue with its dips, dives and contours. Although Léger didn't play "Aqualight," which is arguably his biggest song, his remix of Mexican DJ Rolando's "Jaguar" went over well with the crowd of roughly a thousand. Throughout his set, he commanded control over the audience, inspiring the kind of unity that makes total strangers break out in spontaneous dance with each other. Ascending Italian DJ Riva Starr preceded Léger's set and proved why he's earned co-signs from heavy hitters Pete Tong and DJ Tiesto. He spiced up his otherwise typical house sound with such whimsical oddities as traditional Balkan rhythms on "Black Cat, White Cat" and an expertly timed Jim Morrison vocal sample. Forrest., a Montreal native currently based in London, England, opened the evening amidst foreboding clouds that made for a spectacular view of the city from the site's lookout point. His Piknic set marked his first-ever live performance, and he fused pop and house to create a moody and sensual aura. One standout among the several original mixes Forrest. delivered over the course of an hour was "Milano." Many of the other tracks he played are not yet officially released, but the Montrealer proved that he has enough material and talent to put out a strong full-length album. In contrast with Saturday night's reveling atmosphere, the attendees on Sunday spanned all ages from toddlers to seniors. The vibe was all-inclusive as families enjoyed lunch in the sun and the slightly older set drank bottles of wine and let loose on the dancefloor. The most stimulating performance of the day came from Booty Based Mob, a trio of young Montreal DJs consisting of Phil Sparkz, Bongiovanni and Compton Chic. They took turns on the GURU stage from 3 p.m. to 7 p.m. straight, and the pace never slowed down. Incorporating disco, house, R&B and hip-hop into their eclectic dance beats, these guys displayed contemporary attitude and impeccable taste. Some highlights from Booty Based Mob's extensive show were a sped-up remix of Timbaland-produced Aaliyah jam "Are You That Somebody?" and a Gucci Mane song flipped into stuttering Chicago juke. Along with these better-known sources, they also spun tracks from like-minded hometown allies Kaytradamus, High-Klassified and Hesk. Over on the main stage, four veterans of the Montreal scene -- Mateo Murphy, Pheek, Eloi Brunelle and Mossa -- kept the party going with their minimal techno. All four came together for the finale, which was as satisfying an ending as a heaping plate of poutine after a wine-soaked Montreal night. To see Exclaim! 's Piknic Électronik photo gallery, head here.